Before Anchor became a full-fledged commercial brewery, it was a beer and billiards saloon near Russian Hill. A lot has changed over our 121-year history, but we’re still big believers that great beer plus great friends will surely bring great times. With that in mind, we couldn’t be more excited to announce our new pilot brewery and bar: Anchor Public Taps. 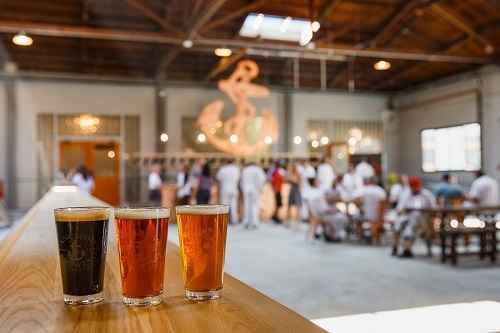 Opening on Saturday, October 21st from 11:00 am to 9:00 pm, Anchor Public Taps will feature both classic and new beers, while providing a gathering place for anyone seeking a one-of-a-kind San Francisco experience. 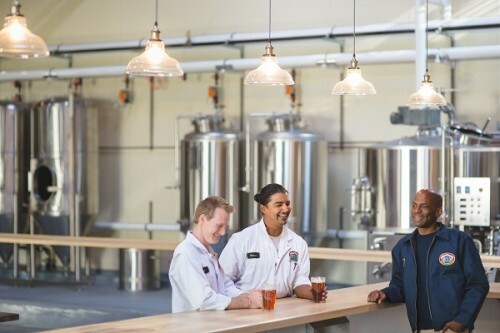 Just across the street from our iconic Potrero Hill brewery and taproom, Anchor Public Taps will also be home to The Potrero Project—a collection of beers exclusively brewed in Anchor’s pilot brewery for Public Taps guests. Public Taps will have some of the best local food trucks scheduled daily, as well as a calendar of special events, making it a place for celebrating the unique San Francisco community. Anchor brewers are steadfast in their brewing traditions, but they are also experimenters and scientists. At Public Taps, Anchor will showcase its unique brewing philosophy and bring a little bit of San Francisco to a whole lot of beer. The Anchor Public Taps team: Dane Volek, Pilot Brewer, Ramon Tamayo, Lead Brewer, and Derek Hunter, Director of Hospitality. The design of Public Taps reflects Anchor’s ethos of maintaining tradition while being radically inventive—from the reclaimed redwood of the water storage tanks, to copper from Anchor’s old brewhouse, to brewing equipment and beer collections from Anchor’s robust archives. A collaboration between Anchor’s staff and its partners who are experts in their fields, the design celebrates local craftsmanship and originality. Join us for our Grand Opening Event at Public Taps on Saturday, October 21st from 11am-9pm. Public Taps is open daily from 11:00 am to 9:00 pm. It is family friendly and dog-friendly on the patio. Learn more about Anchor Public Taps at www.anchorpublictaps.com and follow Anchor Public Taps on social media.